It should interest you to know that Green Gillworth was a farmer in an area of Montgomery County, Illinois known as Township 12 (which at one time used the Girard Post Office, then Virden’s). It was the year 1866 and Green was twenty-seven years old. He made his home with his twenty-four year old wife, Margaret and their two daughters, Laura and Lucy (seven and three, respectively). 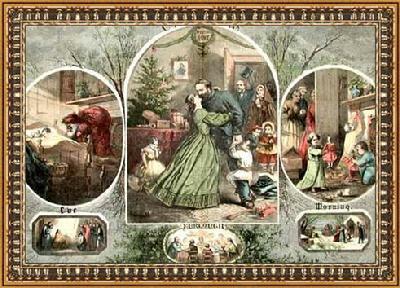 During the couple’s brief marriage they had buried four other children; Charlie (8 months old: January 5-September 8, 1857), Martin (3 months: February 19-May 15, 1861), Mary (3 months: August 13- November 13, 1862) and Julia (3 months: October 28, 1866- January 24, 1867). Another son, Green Jr., is assumed to have died soon after his birth on July 24, 1868 (although no exact date or age is known). The only evidence we have for this claim is the 1870 Census, which was taken two years after the death of Green Gillworth, Sr. in 1868 (in July, 8 days before the birth of Green Jr.) in which the widow Margaret is now the wife of Josiah Jackson and only the two daughters she had with Green Gillworth are listed. Editor’s Note: Again a discrepancy appears with the spelling of names on the Censuses. Firstly, Laura, the true spelling of the daughter is recorded as "Lora" in the 1860 census. Also, there is a difference between personal and official records of the spelling of Gillworth. In the former it is spelled with two "L’s" and the latter, with one. For the sake of argument, we will use the spelling used in our personal records. Elsewhere, Michael O’Connor was 10 years old and presumably living in Iowa in 1866. His early history is sketchy, but what is known is that he emigrated from Ireland with his parents and two brothers. On the journey, his parents took ill, died and were buried at sea. The brothers were separated after arriving in New York and no further contact was made between them as far as is known. In later censuses, as you will see over time, Michael O’Connor’s birthplace is listed as Iowa, that his parents were from Ireland and that farming had become his occupation. Now that I’ve introduced you to people you’ve never met before, I will continue the story of the folks you already know. In a town called Dry Fork, near Sorento, Illinois, in a log cabin they called home, Thomas Wyatt continued to work his fields and Elizabeth Jane tended to her household chores. Nine months had passed since their marriage and they soon found themselves in anticipation for a blessed event. On October 25, 1866, I, John Logan Sigley was born. At this point in my narrative, comes a joyous milestone, the turning point in our family’s history. One hundred, forty-three years ago yesterday the Evans’ became an important limb on our family tree; twenty-one year old Elizabeth Jane was wed to twenty-eight year old Thomas Wyatt, in their hometown of Walshville, Illinois. You will notice the name of the applicant for Elizabeth as Joseph Evans and not John. There could be a number of reasons why the brother and not the father acted as applicant on the affidavit. Perhaps at the age of 63, John Evans was ill or otherwise incapable of tending to such matters. He may have been out of town when the urgency for marriage arose and the matter was left in the capable hands of his son. Another plausible reason could be a conflict of interests in that he felt his daughter, coming from relative affluence, should not have settled for a dirt farmer. If he could not earn enough to pay even a single farmhand, how could he support a wife in the manner to which she was accustomed? Unfortunately, I do not know the exact answer and I must leave you, as well, to this guessing game. Whatever the reason, two days after the date of the application, as witnessed by the county clerk, William Shirley, on Thursday, January 18, 1866, Thomas Wyatt and Elizabeth Jane became husband and wife. Dear readers, I present to you for the first time, my parents. Editor’s Note: The name Sandy Leitheiser, which appears on a form at the bottom of the affidavit page above, is the current County Clerk who approved release of this information on September 29, 2008. Welome back. Happy 2009. I trust everyone's holidays were joyous and reflective and that you are all rested up for the year ahead. I certainly enjoyed my little vacation, but, all the same, I am ready to get back to work. With the Civil War over, the fabric of the changed nation began to be woven into a new pattern by those fortunate to have returned home. Although there is inconclusive evidence, by official document or by hearsay, of Corporal Thomas Wyatt’s exact movements after the war, it is a safe speculation that he had been in residence at his Walshville, Illinois home and farm in the early winter of 1866. As conjectured in our November 10th, 2008 installment, my uncle John left the blacksmithing business in favor of a more lucrative occupation in coal mining in Allegheny County, Pennsylvania. The question also arose, in that same chapter of our story, as to the status of my grandfather, John Sr.’s position concerning the saloon, whether he was owner or employee. We have found tax records that can substantiate that he was indeed the proprietor of said establishment for at least the period between the years of 1862 and 1866. Also in Walshville, profitable farmer John Evans, as previously posted in these chronicles, and according to the 1860 census page–where the family name is misspelled as Ivans, had begun thinking about retiring from the rigors of tending to the land. This decision had become a reality, as shown four years later (in the 1870 census) where Mr. Evans is recorded as retired. With the harvest in for the season, John Evans was able to turn to his attention to his now twenty-one year old daughter, Elizabeth Jane's, upcoming nuptials. The date was set for Thursday, January 18, 1866. It looks like Christmas has sneaked up on us and is only three days away with the New Year not far behind, and I would like to take this opportunity to wish you all a happy holiday season. My team and I will be taking a little time off during the holidays to enjoy the festivities. We will return with a new chapter in the McGinty Chronicles on Monday, January 12, 2009 and we will further explore the Sigley Family history. The Civil War has ended and it’s time to move the family along. I hope you have enjoyed seeing my father’s personal belongings in the past few installments as much as I enjoyed sharing them with you. Merry Christmas to you and yours and have a happy, healthy and prosperous New Year. With this week’s slide show of pages from an Inventor’s Guide–How To Obtain A Patent, I am jumping ahead with a peek into the future (considering I have not yet been born). Necessity is the mother of invention; sometimes new things come about for the sole use of the inventor or, sometimes, for the benefit of the masses. Surely someone will find a use for even the most mundane item. A brick, for instance, meant to build houses, makes a terrific door stop in an emergency and in turn, the angular design of a door stop can help keep your china cabinet from wobbling and thus keeping your spouse from staining her cheeks with tears when her best dishes get broken. Yes, your’s truly once had a new idea up his sleeve but, for now, I will keep that a secret until we catch up with the time line in our story. This week, I’d like to walk with you down a nostalgic path and we will peek into the world of cures and remedies, as described in Pierce’s Memorandum And Account Book, published by the World’s Dispensary Medical Association for the 1888-89 season. In it are described ways to alleviate the discomfort of ailments from consumption to "diseases of women". Also, throughout, you will see more of Father’s random handwritten notations. A picture is worth a thousand words, they say. And to each of us, using our own imaginations, these things will tell a unique story. The items I’m presenting to you this week might lack the definitiveness of the historical information in the publications and the official documents shown in past installments, but they should bring to mind various possible scenarios. As for me, I presume they were my father’s possessions; however, what if any of them were handed down to him by his father, or even by his grandfather, and so on? That is unclear, but quite possible. After all, I will be passing them down myself. In this week's slide show presentation are some of my father’s personal effects, which are an assortment of G.A.R (Grand Army of The Republic) buttons from his Civil War uniform; a pair of spectacles and their thin metal case; his money belt (it is unknown if it was part of his uniform or something he wore as a civilian); a turkey caller; a pipe bowl; a straight razor; his pocket watch, which as of this writing still keeps time. The last frame in this slide show is a page fragment from the 1902-1903 R.L. Polk & Co. Classified Business Directory of Springfield Illinois listing the watch manufacture, Pierik. It is the last item in the right hand column. In a few days, Thanksgiving will be celebrated across this great country and "thanks" will be said for many reasons and in spite of others. More specifically, financial woes which seem to be affecting everyone’s pocketbook of late. But being surrounded by family, friends and cherished memories, at least for one day, worldly troubles can take a temporary place in the background. I am grateful for the life I lead, good, bad or indifferent and for the scant pieces of our family’s puzzle that remain today. If only we had more tangible information to provide so that our early years would not be so full of speculation, I could present our history in a more cohesive fashion, but I think there is enough to paint a somewhat clear and as accurate as possible picture. Of course, while it would be nice to have more, what we do have is invaluable as it has been our greatest tool in telling our history. In this week’s installment, I want to share with you some of my father’s personal belongings. The first item is a diary he obviously kept from the time he was in the war. Most of what you will be seeing and, with any luck, deciphering for yourself, is made up of names of family members and their dates of birth and, when applicable, their deaths as well.. Also there are recipes for ointments and salves mostly for the treatment of horse ailments such as fistules (blisters) and knee and shoulder sprains. Some pages show financial figurings for jobs done, such as hog killing, monies paid for articles of clothing, food and concerning a weat (wheat harvest), etc. There also is some child-like scribbling as though the diary may have gotten into hands it should not have. My memory will not allow me to say for certain if mine were guilty of defacing this book with childish doodling or of using it to practice my penmanship. There is also a page, (tile 19) with a few lines of a Civil War era song, "When This Cruel War Is Over", which can be seen in its entirety, along with a little history of the song by clicking here . The Civil War Diary is presented in a thumbnail slide show format and either by clicking on each individual thumbnails below, or the back or foward arrows, each picture will be displayed in the larger window. The second item is a few pages from a service handbook of rules and regulations. As you can see, this particular item needed to be handled with great care and only these select pages were reproduced. By now I’m sure you can understand why we are so grateful for these valued items. Simple as they are, they help us to learn and tell the story of the times that our American family was forming alongside our country. In closing, as I wish you all, my dear readers, a happy Thanksgiving, I'd like to leave you with a piece of historical information on how this holiday we celebrate today came to be. As I’ve mentioned earlier in these chronicles, no one ever thinks it necessary to hold onto bits of his or her present. It is inconceivable to think these pages from yesterday could have the slightest bearing on the future. But without those tidbits, important to whomever, whenever and in whatever degree, there would be no history to record in books, no way of learning from past mistakes, though in the case of wars, that lesson was clearly skipped by many and it seems to have lost its impact and valuable instructive value. Without those time-tattered mementos, there would be no trace of a person’s history, should anyone be so interested in knowing it. There would be no idea of where he came from, no odd questions answered such as why a person’s hands fall a certain way at one’s side, or who else might have shared his name or the color of his eyes. Without these links to the past, we would never know of any accomplishments that would send a shiver of pride up our spines. Such is the case with this family, these Sigley’s who came across the Atlantic and settled in New Jersey and who later blazed a trail and ventured westward, and who became so involved in the welfare of their new homeland that they enlisted in one of this nation’s greatest contests. What we have is not much, but it is enough to tell us some very interesting things the earlier Sigleys. Specifically, my father’s army itinerary will today serve us a dual purpose in this chronicle. First, it shows us not only his progress to Corporal, but how that rank was justly earned. As the Civil War progressed, he traveled further and further away from his home in Walshville, Illinois and throughout his three years plus service was active in so many campaigns that only some of them have been listed. Secondly, but just as important, this document itself illustrates our family’s penchant for conserving our history. Someone wrote down where Thomas Wyatt was during the Civil War. Almost a century later, while this was still readable, a descendant, using the best method available to her, copied it into typewritten form. Most recently, after investigating and plotting where these battles and stops on the itinerary were on the US map (then and now), with the use of more sophisticated technology, this document is available in the formats seen below and can be shared globally and with ease. From simple handwriting, to the typed format, to the ethereal internet availability of Thomas Wyatt’s war record– one point remains constant–it will be available as future Sigleys and their contemporaries look back at our family only because of those who have chosen to preserve and pass it on. Please track with me my father’s itinerary during the Civil War and see how dapper and proud he looked in his army uniform in this treasured tintype. Approximately six months prior to the end of the Civil War, on September 5, 1864, Thomas Wyatt was mustered out and discharged from the service. After a very active army service, my father returned home to Walshville, Illinois and continued to farm his fields of corn and beans. You saw the muster out page at the end of the muster roll in a prior installment and here I present his official discharge from the service. In the meantime, my uncle, John W, continued his service in the war and was, as you saw in last week’s installment, mustered out on June 8, 1865. Presumably, two months after the war ended, he went home to his wife, Catherine and seven year old daughter, my cousin Alice, and most likely resumed his occupation as blacksmith in Belleville, New Jersey. This assumption, as you see below, may not be entirely correct. During the decade between the 1860 and 1870 censuses, we see a shift in the original Sigley household in Bellville, New Jersey. Aunt Alice had left home to start a family of her own with Arthur R. McCluskey and Aunt Sarah Ann had wed Henry Dickenson. 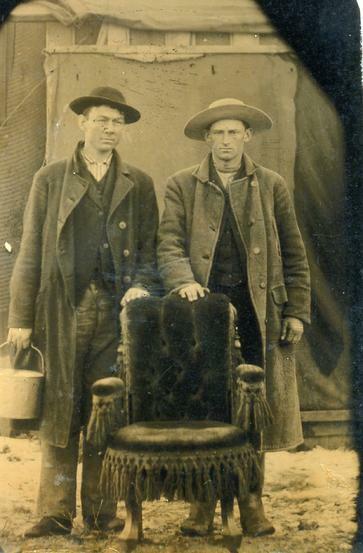 Grandfather John, most likely due to his advancing age, had retired from the physically demanding profession of blacksmithing and took work as a saloon keeper. Whether he owned the saloon or simply tended bar is not known. After his discharge from the army there is no further personalized information on Uncle John. My researchers have spent countless hours investigating personal family documents and correspondence and searchable databases (another thing of futuristic amazement for this corn-fed writer) and heretofore have only been able to come up with the censuses below. Since all we can use to rebuild my Uncle’s history are these two documents, intelligent suppositions, while not accepted as the gospel truths, can be seriously and safely entertained. In the 1870 census, the John W. listed is married to Betty. No speculation is made to his first wife Catherine’s or his 12 year old daughter, Alice’s whereabouts. They have not been found on any other census and while they could have moved away from John W. after a divorce and simply not been counted, perhaps they both died. However, by the time of the 1880 census, Elizabeth (Betty?) Clark is married to Edward Clark, but in the household is a step son, John W. Sigley, III, my cousin. We take assumptive license because of his being the third John W. Sigley. He is the key to deciphering and validating the supposition that my Uncle John W. married Elizabeth (Betty) sometime between the end of the Civil War and the 1870 census and they had a son. By the time of the 1880 census my uncle might have separated from his second family, but since he doesn’t appear on any later census he most likely died and Elizabeth remarried. Even with all the smart guessing my descendants are attempting to justify, the lack of certain proof has forcibly made the focus of my chronicles to be on my father and his family line where luckily just a bit more is known, if nothing more solid, through word of mouth. Should the mystery of my uncle’s later years unfold further or new speculations come to light, I will keep you informed. What does exist, however, among our collection of family keepsakes, is a photograph of my father and (to his right) someone who we suspect to be my uncle John W. We base this strictly on his strong resemblance to another family member as will be illustrated in about 35-40 years. I need to repeat that before I, or any of my collaborators on this project, make an assumptive statement, much thought, research and trepidation is suffered. As we move forward in our quest, if any discrepancies to what we’ve told you are found, I will happily divulge them and chastise us all to continue our work with a greater degree of vigilance. 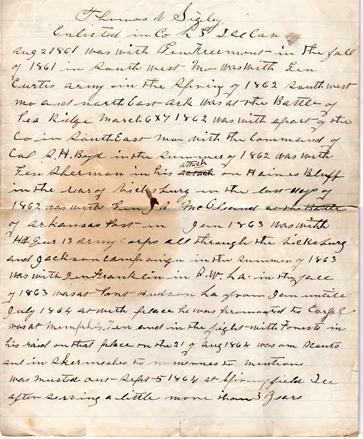 Editor's note: This document contains John Sigley's signed Volunteer Enlistement letter; Recruitment Statement; the index card and muster in page of his muster roll. Editor's note: This document contains the remaining pages of John's muster roll, including the muster-out date. 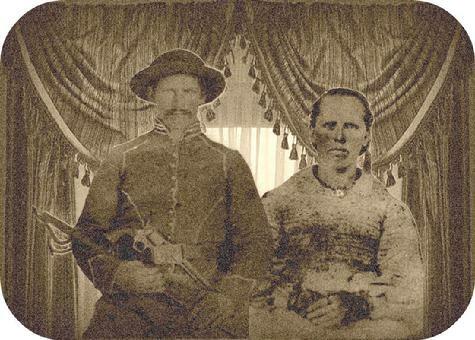 No matter how proud and full of love of country my grandfather might have been, it was a sacrifice for him and the rest of our family to know both his sons had left the relative safety of their homes and occupations and joined the Union army. Unlike the Confederacy’s desperate need for soldiers, the better populated North did not run short on volunteers to join; there was no dire urgency for recruits. I am proud that both my uncle and my father chose to join the Union and fought for its worthy cause and am most grateful they were both returned to our family safely after their service. During the war years, according to the 1860 census, the Evans family of Walshville, Illinois, (listed in this census as Ivans, and also mistakenly, as Evens in the 1850 census) continued to farm on their land that was valued at $1,600. Some of the names between the two censuses have changed; a new farmhand, Alonzo Laskin has been added, joining John Pricket (Jacob Pricket had obviously left for greener pastures, no pun intended). A young boy of 7, James L West, was also included. Perhaps he was the child of one of the Evans sisters, or perhaps even an adoptee. Most of the older Evans’ children are no longer listed, leaving me to believe they, too, have moved away or died, and perhaps it will be worth looking into at some point, but the one important name that remains is that of sixteen year old (Elizabeth) Jane. While the country continued to rumble with political unrest in the late 1850's and the beginning of the 1860's, dirt farmers in the Midwest like young Thomas Wyatt, who was now in his early twenties, continued to raise crops of corn and beans, tilling the land with plows pulled by teams of horses and the yield harvested by hand. It was grueling but proud and honest work. Back in Belleville, New Jersey, according to the 1860 census taken on July 18, we see that my uncle, John Jr, who maintained his profession as blacksmith, had taken a wife, Catherine, and they had a daughter, Alice. Judging from the young girl’s age at the time, I will assume this matrimonial union took place 2 years prior. Also, in another record page of the 1860 Belleville, NJ census, at the household of my grandfather John Sr. now at the age of 54 shows a curious bit of information. Again it is speculation, but it seems that Grandfather has taken a new wife, an Irish woman by the name of Mary. As statistics show, the divorce rate then was quite close to zero so my assumption is that Martha, my grandmother, had died. Also in this census is the inclusion of Jane Huff, a fifteen year old girl who, ten years earlier, when included in her own family’s census, was marked as mulatto. Here the girl is taken for "white". Also, please note, the marking of the daughter, Sarah, as being a servant. I don’t want to be assumptive–Heaven knows I could be wrong–but it is my thinking that marking was incorrectly made and that it was Miss Huff who was the servant. Just as an aside, during all this research, I have found quite a few skewed details, which, at some point in the future I will discuss. To do so now would spoil future chapters in my chronicles. But, suffice it to say that some of the information in these censuses are minutely inaccurate and there could be several reasons, not the least of which would be widespread illiteracy. 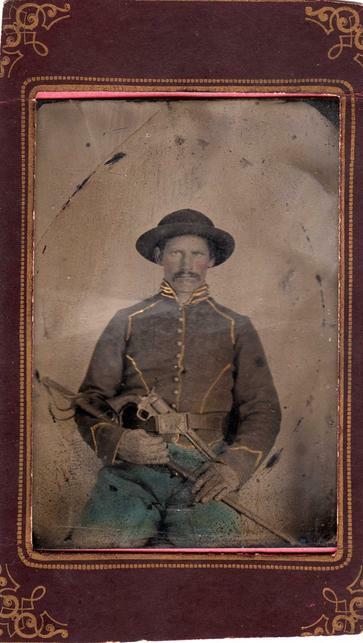 April 12, 1861, what history books have hence refered to as the Civil War began and a few short months later, just before his twenty-fourth birthday, my father, Thomas Wyatt Sigley enlisted in Company H, 3rd Illinois Cavalry. Back then, the North fought "The War Of Rebellion" against what the South called "The War Between The States" and Thomas Wyatt joined a fight his fellow countrymen had brewed for decades. Editor's note: While this muster roll follows a month to month description of Thomas Wyatt's activities, from his muster-in date to his muster-out date, there is a period of one year that is missing. That will be explained in a future installment. Because it is part of the entire document, the page indicating Thomas Wyatt's muster-out date is included. So much has been documented, even fictionalized on that period of our nation’s history that there is little I could add that would be new. One thing that is obviously agreed on is that our young country chose to end slavery and with the Union’s victory moved us forward to growth and with that growth came obligatory future conflicts. One consolation of the Civil War is that the blood shed on both sides resulted in freedom for the oppressed slaves. Future generations can look back and clearly see that. Unfortunately, not all American bloodshed, whether or not war-related and either here or on foreign soil, can be so clearly and historically justified. After the war of 1812, Congress rewarded the men who had served with "Soldiers’ Bounty Lands", 160 acres in what was known as the Illinois Territory, an area in the country’s mid west which was populated by scattered settlements of Kickapoo Indians and a small migration of "white" people. Simple, log cabin homes were built and land was cleared for farming. On February 12, 1821 after a petition by early residents, Montgomery County, Illinois was formed. The county was named after General Richard Montgomery, the Revolutionary War hero killed in the assault against Quebec on December 31, 1775 and many townships began to appear including Audubon, Bois D’Arc and Walshville. In the early spring of 1844 in Walshville Township, John E. Evans of Knoxville, Tennessee, a forty-one year old farmer, and his wife, forty-three year old Anna Evans, nee Holbrook of Georgia, welcomed their fifth child, a baby girl, Elizabeth Jane, into the family on April 2. Her siblings were twenty year old Delena, Thomas (15), Honor (12), and Joseph (10). The household also included John and Jacob Prickitt (23 and 22, respectively) and Jacob Tinley (19). These young men were most likely farmhands. The 1850s was a decade of change, not only for the Sigleys but for many Americans. People were increasingly migrating where the land was said to be rich and prime for farming and "Illinois Fever" spread westward across the young undeveloped country. Thomas Wyatt was one such pioneer to make the journey west. It is unknown exactly what Father’s reasons were, but I can speculate on the possibilities. Perhaps he had no desire to join the blacksmith business like his father and brother. Perhaps he had grown weary of the dour employment climate in and around the northeast. It may also have been an overwhelming sense of adventure. Possibly, he may have been exhibiting the see-sawing Sigley family trait I have I have witnessed over the generations, including our current one, where one prefers the tranquility of a rustic and bucolic lifestyle and the next thrives in the frantic hustle and bustle of the modern cities’ lifestyle. The most logical reason, given the known fact of his future vocation, is that he wanted to take advantage of the fortunes "Illinois Fever" could provide and went to realize his inbred passion for farming. Whatever his reason, in 1852, at the age of 15, young Thomas Wyatt said goodbye to New Jersey, to his parents John and Martha, brother John, Jr. and his two sisters, Alice and Sarah Ann. As Father headed for the land of greater opportunities, eventually to settle in Walshville, life continued for the Sigleys of Belleville. Second River. In the 1700's it was considered an eminent center of industry and manufacturing in Northern New Jersey. In the early summer of 1797, the inhabitants of the community decided it was time to give their town a new name. According to the minutes of the June 24th meeting at the home of John Ryerson, the town would be "hereafter known only by the name of Washington". But that name was not entirely acceptable to some residents. Some argued that Washington applied to a larger area than their village and so two days later, on June 26, another meeting was held where the name was thenceforth changed to Belleville (French for beautiful land) and it was confirmed with the signing of the minutes by Josiah Hornblower, the clerk of the meeting. October 10th, 1840 was an auspicious day for the Sigleys of Belleville. John, the elder became a citizen of the United States of America. Antebellum Belleville, like so many industrial areas of the Middle Atlantic region of the country was overrun with a heavy penetration of European immigrants, mostly Irish escaping the infamous potato famine who were willing to work for less money and, logically, glutted the job market. Life continued for the Sigleys in these financially questionable times. In 1842, a daughter, Alice, was born and year later, her sister Sarah Ann. John W. followed in his father’s footsteps and began apprenticing as a blacksmith. I ask you to direct your attention to the following census report from 1850. You will notice the curious omission of the young girl who was listed ten years prior. Since in that census only heads of households were listed and as such she was not named and there has been no further mention within the family records, I can speculate that if she had been born into the Sigley family, it is presumable that she died, but could have lived to a maximum of 14 years of age, or she might have been in the temporary care of the Sigleys and was present when that census was taken. The name John Rogers also appears. Again, not knowing anything more than his employment status as a laborer, it is nearly impossible to trace such a common name, with no other future mention of him anywhere. One can assume almost any reason why a man at thirty years of age would be living with another family. To further speculate, perhaps he was a friend of the family from England. He may have been someone who worked with the master of the house at the blacksmith shop. Most likely, to his and the Sigley’s mutual benefit, he was a border renting a room. These decades indeed were rough. The burden of a scarcity of work and the turbulent rumblings of political and financial unrest that increasingly divided the country with the threat of the South’s inescapable secession, further encumbered the economy and families did what they could to survive. Gratefully, I don’t feel all thumbs, as I first thought I would, using this newfangled technology. For one thing, the keys on this contraption are relatively silent and so sensitive to the touch, like little hair-triggers, by comparison to that old clunker typewriter I used to pluck out my columns in the Sorento Blade and the Farmersville Gazette. Oh the racket those machines created–a veritable symphony of metallic click, click, clicks. Blog. It’s a silly word, really. But I guess in this day and age of a society that seems determined to get to the finish line before the race begins, it makes sense to take short cuts and even condense words. Blog: web, as in the world wide web–I’m still acclimating myself to all this–added to log, as in diary; hence, web log, or blog. Be that as it may, it is still a silly word. Before I tell you about myself, or of my children , theirs, and so on, I should tell you a little about our past. Fleeing English military rule in the mid 1830's, John and Martha Garner came to America with their three year old son, named John, John W. It is rumored that when the family emigrated, the elder John, seeking anonymity for them, took his mother’s maiden name as his own and abandoned Garner thenceforth. Little is known of John and Martha, prior to or after arriving in America. Time really has not been kind to whatever written records, if any, may have existed. Spoken history, over the years, has become muddled, too, leaving so many questions unanswered and I am afraid I am not much help in this case. I remind you that I am an old man. However, and as I stated before much to my surprise and delight, there are those hard at work presently investigating official records on two continents, possibly more (some are so closemouthed as to what they are doing) hoping to find that proverbial needle in the haystack, that one piece of information that will open the door to our past. John, Martha and baby John W. settled in Belleville, NJ where the elder continued his trade as a blacksmith while his wife tended to her daily routine of keeping house and raising their young son. One of the earliest uncertainties that arises in the family’s history is the presence of a young unidentified girl under the age of five at the time of the 1840 United States Federal Census, when only the names of the heads of families were recorded and others in the household were checked off under the appropriate male/female/age category. No family record nor further mention of the young girl exists to date. The autumn of 1837 brought joyous news to the Sigleys of Belleville. On October 14, Martha gave birth to a bouncing new baby boy. They named their new son Thomas Wyatt and he is my father. Click on the above thumbnail to view document in full. Reading left to right, the line highlighted in yellow: Head of Household, John Sigley; 1 male under the age of 5; 1 male between the ages of 5 & 10; 1 male between the ages of 30 & 40; 1 female under 5; 1 female between the ages of 30 & 40.